Not much time to write tonight, so I ‘ll make this short and sweet. Pretty impressive run by the bulls today, but still on low volume and marginal breadth. At the very least, I have to expand the channel I drew yesterday. 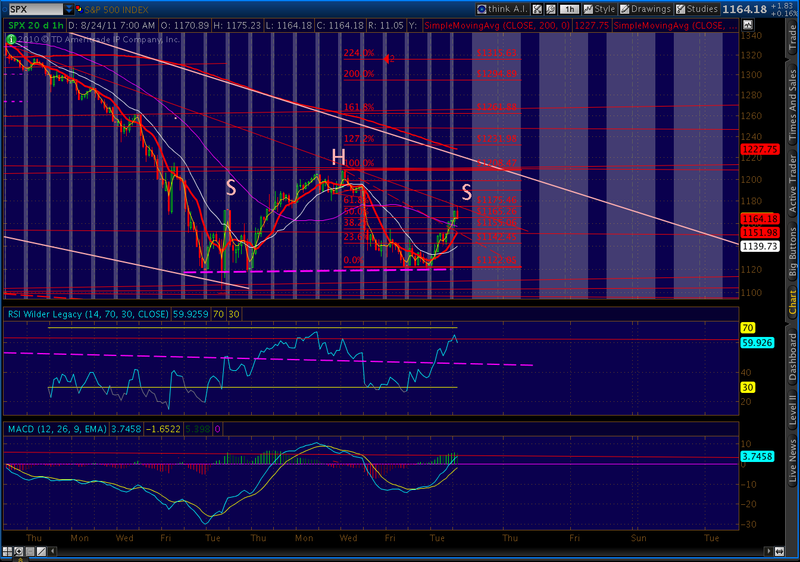 I’m still confident that this is a 4th wave up, with the 5th to come very soon. But, sheesh, I’m feeling a bit lonely in this point of view. Many of the indicators I watch are on the brink of turning bullish. But, they’re on the brink, not beyond. 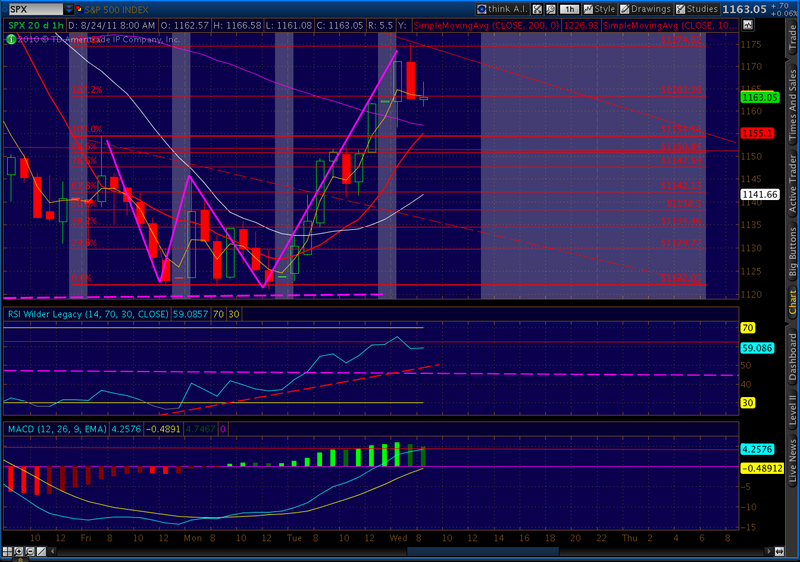 This tells me we’re at an inflection point, as today’s close at the .618 Feb retrace level would indicate. Besides all the obvious, I’m watching the dollar these past couple of days. 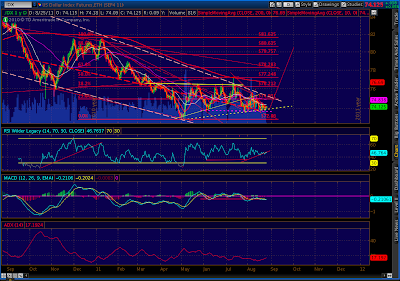 It’s been in a gigantic falling wedge for almost 1 1/2 years. In May, it began traversing from one side to the other of this wedge, hugging a TL that offered great support until July 21, at which point it found support at a lower line. Shortly afterwards, DX started tracing out a falling wedge that just completed. We broke out today, and are currently in backtest mode. If the breakout holds, the next resistance isn’t until at least 75.25. The next day or two should be very interesting. The folks in our Conspiracy Department just floated an interesting idea past me. If you’re a big investment bank or advisory firm and are angling for Ben to break open his piggy bank Friday, do you really want a big, fat rally on the books in the days leading up to decision time? If this thing gets going to the downside, don’t look for them to stand in the way. 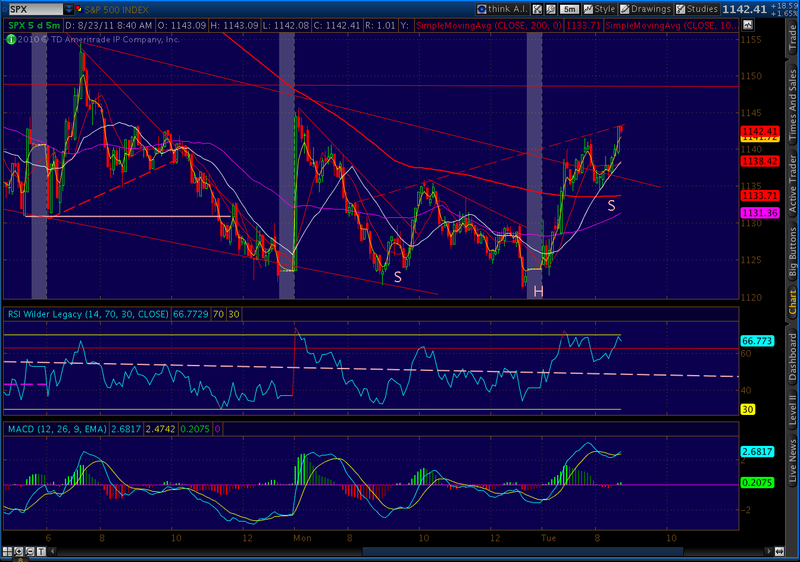 Little H&S; pattern backtesting on the 5-min chart (redrawn on 1-minute.) It’s even completing its own little butterfly pattern. 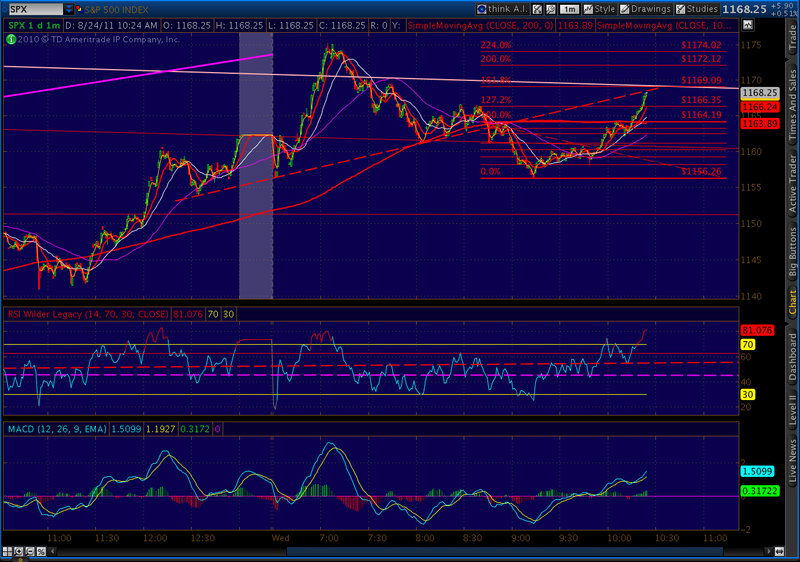 Should reverse at 1169. 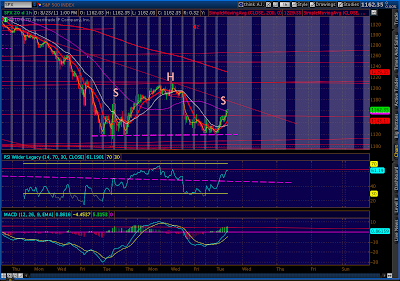 Just a reminder, the H&S; pattern we’re tracking has potential to 1032. Another great way of looking at the harmonic picture from the past few days is the Butterfly pattern started at Friday’s high. The pattern requires a .786 retracement of the XA leg (the first one down) and ends with a 1.272 or 1.618 extension of that same leg. This one is almost perfectly formed. Butterflies are among the more precise patterns, and frequently lead to a sharp reversal that consumes the entire upward move. 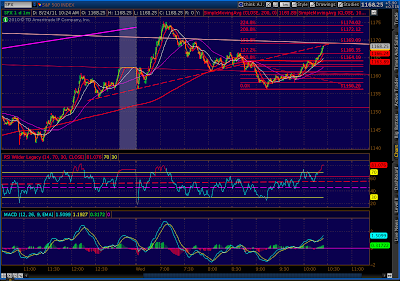 I use the .618 Fib as my initial target, with 1.272 and 1.618 extensions as the ultimate goals. In this case, that would correspond to targets of 1142, 1107 and 1089 respectively. 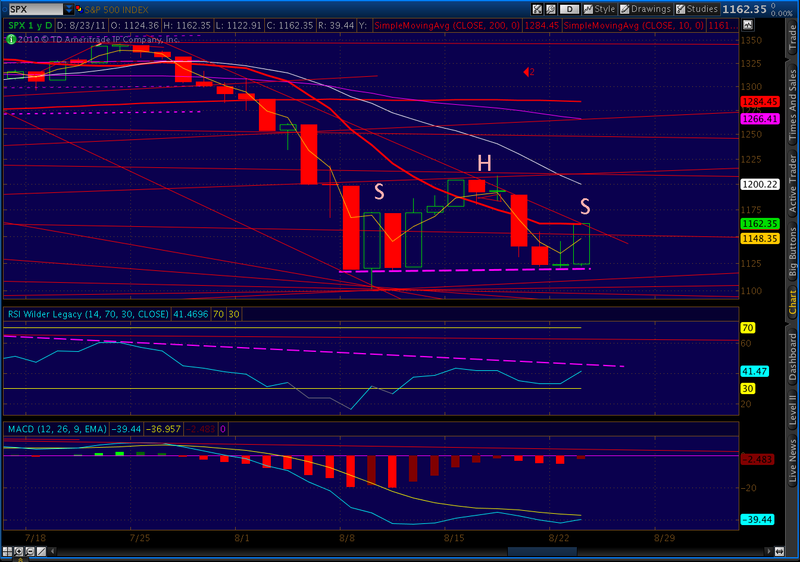 The big H&S; pattern we’ve been tracking, the Big Ugly, is starting to look quite lovely. It completes at around 1121. Obviously, if the Butterfly pattern plays out in any meaningful way, it will complete and give us plenty of ammunition for a downdraft I’ve been expecting. 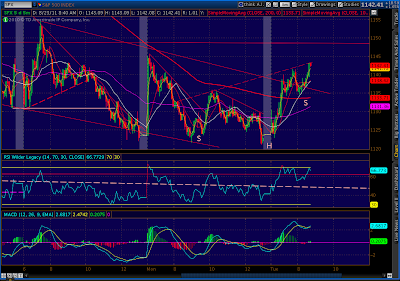 One way to play this would be to initiate shorts or puts here, with stops at the 1175 level. 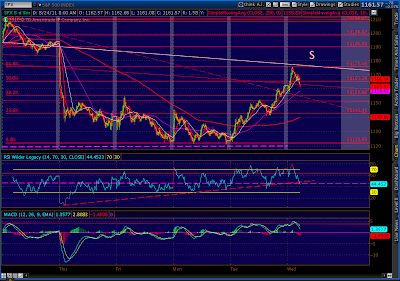 It also makes sense to keep an eye on the RSI trendlines. The 60-minute still hasn’t broken yet, but the 5 and 15-minute charts have broken their trend lines and are in backtest mode. I think the market will pick up on this and start heading down very soon. 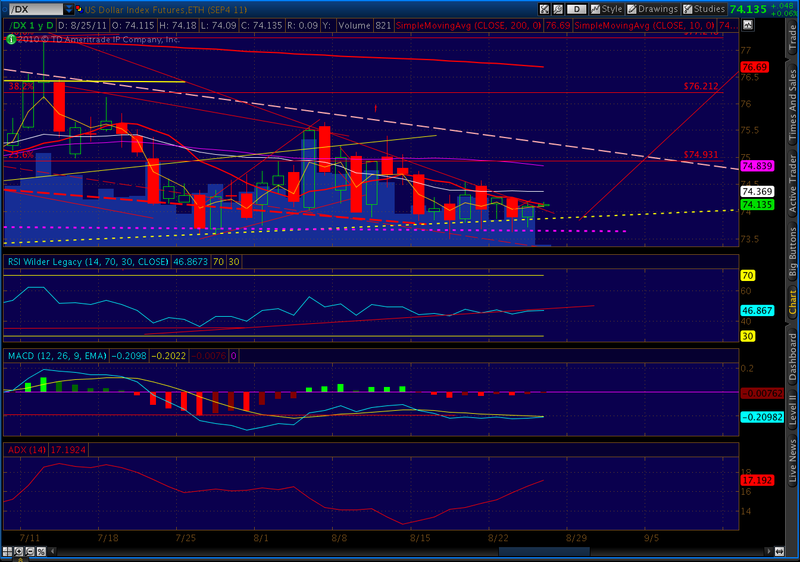 The bears won’t be out of the woods, however, until the RSI trend line (red, dashed) is broken. 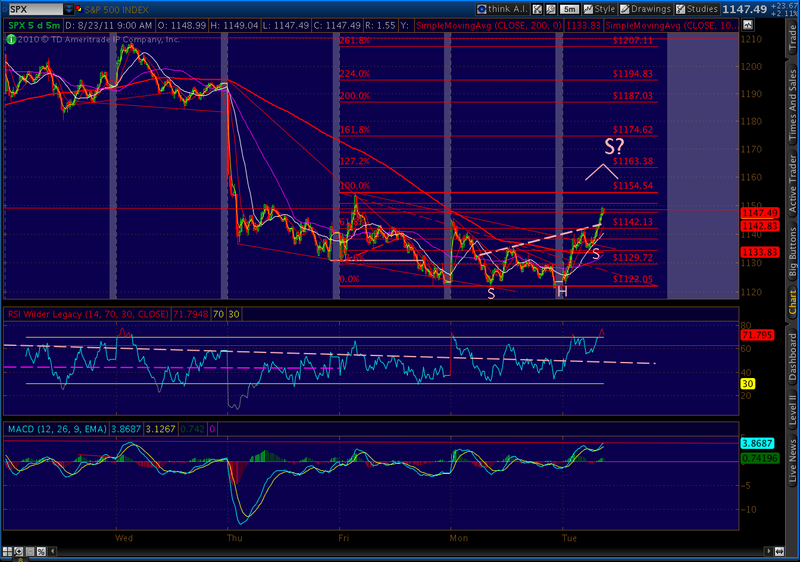 Until then, this pullback could be just a correction of the temporarily overbought condition. Stay tuned. The dollar is showing some strength overnight. 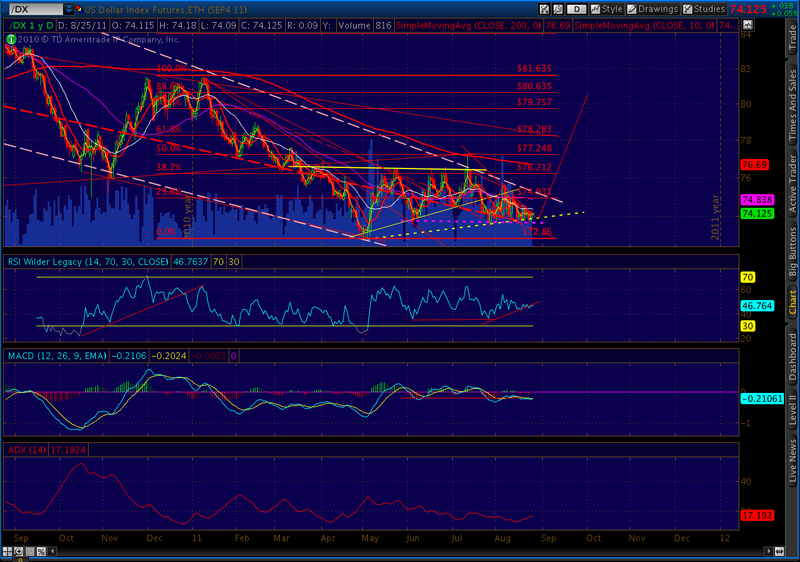 I’ve been watching DX, wondering if it was ready to break out of the falling wedge it’s been in since…forever. 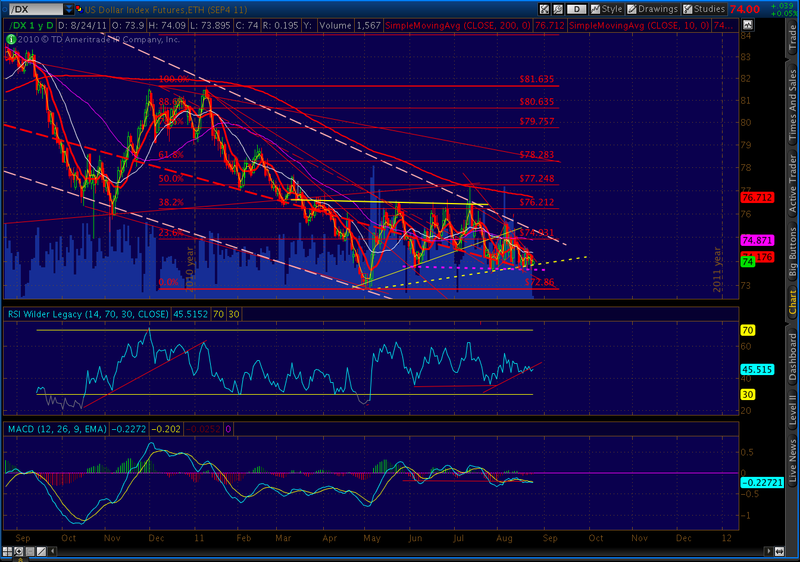 Now it’s in a falling wedge within that falling wedge, and seems to have found good support in the white dotted line. Note that the crab pattern that played out so perfectly at the 1.272 extension has, with a retracement to the .50 level, morphed into a potential bat or even crab pattern. 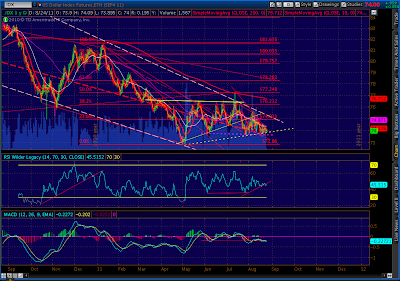 The .886 (minimum) level would be all the way up at 80.635. Such a rally would no doubt be deadly for stocks. Today’s push to 1162 was the perfect follow-through to a pattern in which I hadn’t put a lot of stock — the inverse head and shoulder pattern I posted about at 11:45. 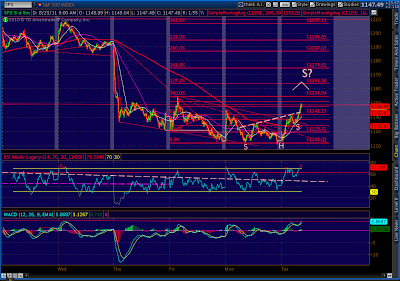 It called for a rise to 1161. The rally also completed a bearish Butterfly pattern (one of a few), the 127.2 extension of which was at 1163.38, and established a better looking right shoulder than we had before for a larger bearish H&S; pattern. The big question now is follow through. Volume and breadth were light today. 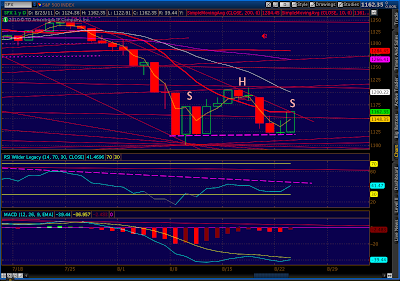 For all the excitement, SPX was stopped cold at the 10-day moving average and the gap from Aug 10 on the daily chart. And, the histogram is still in negative territory. Further, I don’t see five waves down yet. And, this bear market isn’t a great candidate for a truncated 5th wave. I would like to see more evidence of capitulation before believing the upturn is here. 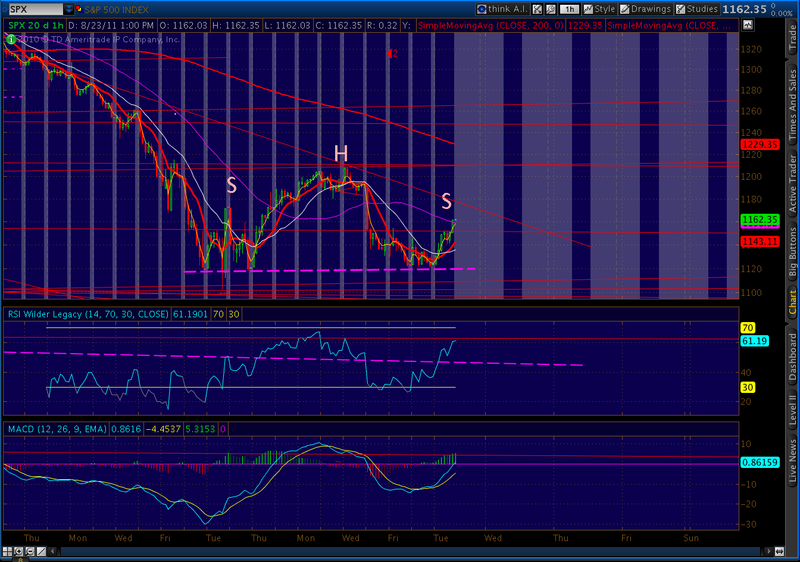 Last, I think there’s a good chance the H&S; pattern we’ve nearly completed plays out. 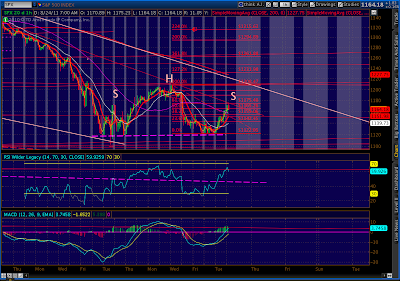 It has potential to 1032. 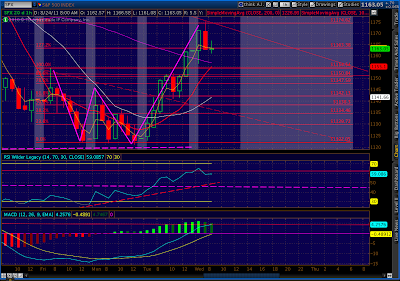 We’re in a steep and narrow channel (white lines) down from the July highs. 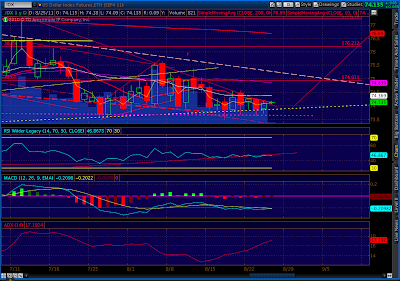 The top trend line of that channel will be the key as to whether we continue down or break higher. 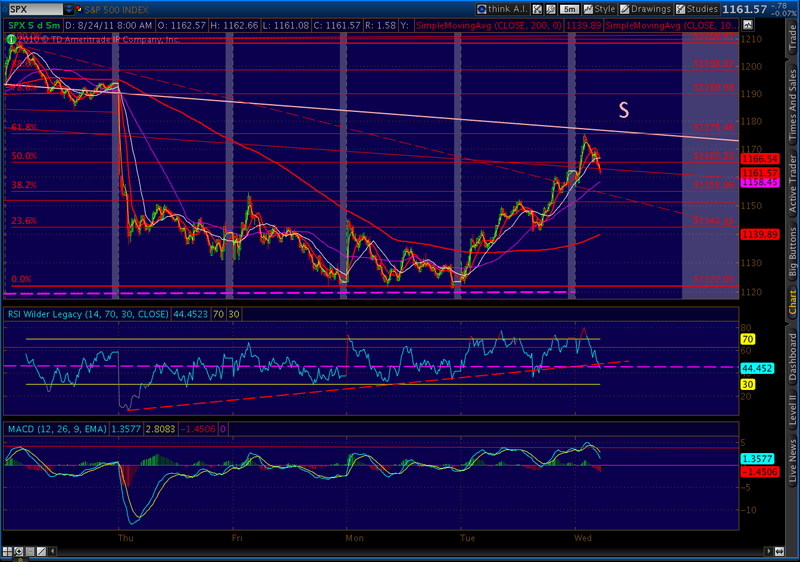 There is also a corresponding trend line on the RSI that I’ll be watching like a hawk. There’s also a good possibility that the trend line (red, dashed) from the May 2 high, together with the channel top TL, will combine to form a falling wedge for the eventual bounce back up to test the previous 1258 lows. Unless we get strong follow-through tomorrow, I’m operating under the assumption that the bears are still in control and we’ll establish a new low around 1067, with 1040 and 1010 being subsequent targets. Maybe it's a question of the bird in the hand… while QE would probably goose the market, this is the real thing here and now. Yeah, that's something that weakens the "conspiracy" case in my mind even further than it already was. 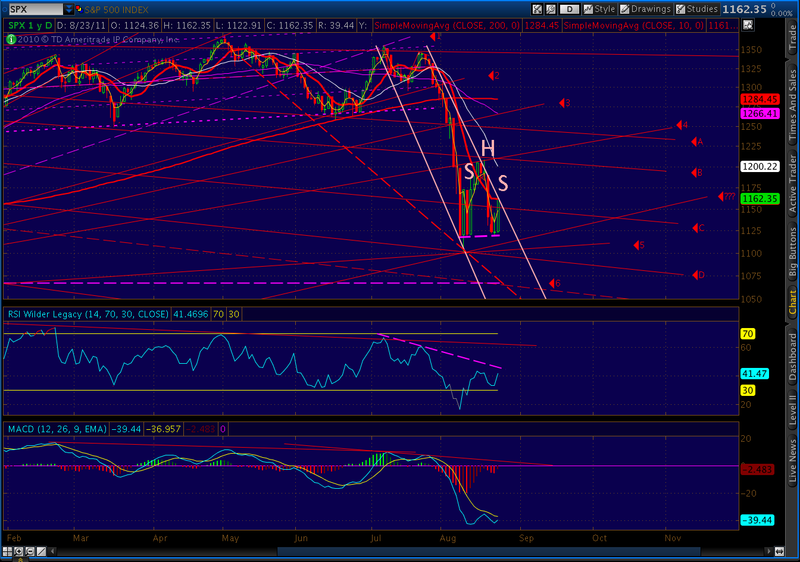 If the supposed conspirators want QE3, why cause (or allow) the market to go up in advance of JH, making QE3 a harder sell? I am sure I am not the only one who sees and thinks this way. But if stocks rally, say to 1250, on the expectation of QE3, then there isn't any reason or need for QE3 because the market has not fallen much for the year. 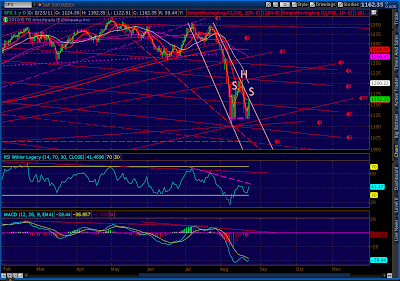 But then again, without QE3, why should the market rally up more? I thought it needed to go down much more to justify QE3. But I guess I was wrong. The market picks a more logical way. Sellers are still just watching. Cease fire before Jackson Hole seems a natural reaction. Pebble, thanks for your sharing. My thoughts on the US markets.